Anyone with an interest in Astronomy should own a good pair of binoculars. Even avid amateurs with a houseful of telescopes will have at least one pair of binoculars at the ready. If your main interest in astronomy is exploring the fine details on planets or showing structure in distant galaxies, you will probably also eventually want to get a telescope as binoculars just don’t have enough magnification. However, if are new to astronomy or if you thrive on large open star clusters and big, extended nebulae, binoculars can actually work better for you than a telescope. It is often said that binoculars are the best “first telescopes” you can buy and even an experienced astronomer usually keeps one with them at all times. The video below is of Bill Burgess, the owner and founder of Burgess Optical, world-renowned for its custom-built telescopes and planetary eyepieces describing why a set of binoculars may be best option for you especially when starting out in astronomy. Most amateur astronomners will tell you that they might have beaut large telescopes and all the gear to go with them BUT they always carry a good pair of binoculars. You use ’em to scan the sky and zero in on what you want to point the telescope too. They are not only invaluable – they are necessary! 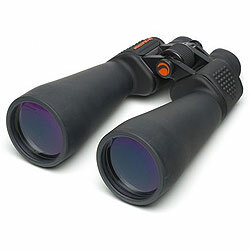 What pair of binoculars that you should get, will depend on how specialised and exactly what you want to use them for: The best binoculars for someone who wants to observe the stars with, but also then use during the day will be different to those that want to only use the binoculars for star gazing and don’t have to worry about carrying them about. The purpose of this guide was to help you understand how to choose the best binoculars for astronomy. While so much information on binoculars may seem a little confusing at first, just a little study will take you on your way to discovering astronomy binoculars that are perfect for you!But if you trust me, and just want a suggestion… here you go. With thanks to Tammy Plotner. The best type are 7×50. These are the ones we not only sell and recommend.. but we use ’em too! The clarity is superb and the quality perfect! Premium Quality – Standard size 50mm. Easy to hold, comfortable eye relief, attaches to camera tripod for stability, suited for day/ night use, well made. What you’ll see is literally outa this world! PLUS you get FREE membership to my ‘advice/help’ line, and my FREE weekly astronomy newsletter ‘Astro-Space News’. Just register!